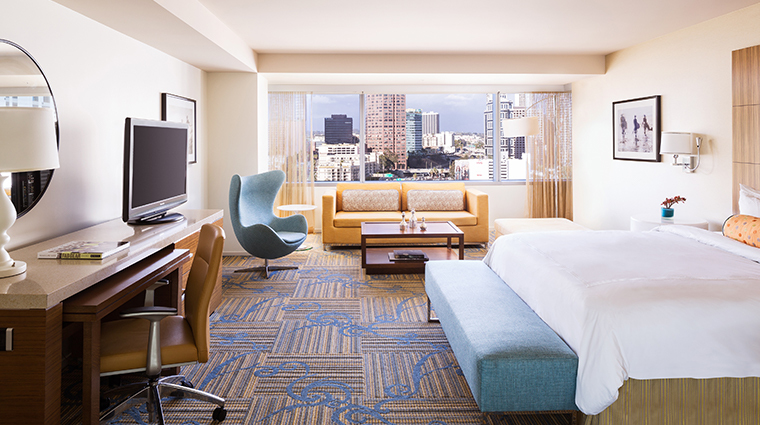 Business meets pleasure in downtown L.A.
With the bustling Los Angeles Convention Center seeing more than 2.5 million visitors annually, JW Marriott Los Angeles, L.A. Live was a necessary addition to downtown Los Angeles. After a 20-year dry spell, the completion of the 878-room hotel in 2010 marked the launch of the area’s first upscale high-rise. 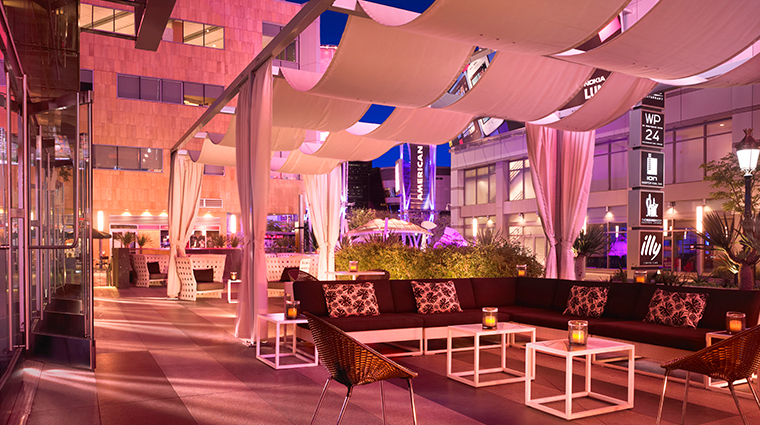 With amazing access to L.A. Live, a megawatt conglomerate of sports, entertainment and dining venues, this luxury hotel accommodates a large volume of guests each day. 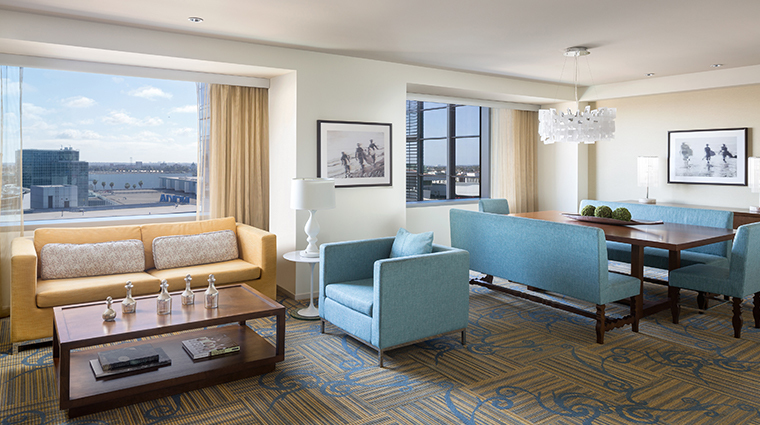 For conventioneers, business travelers and those in town for special events, there is unparalleled convenience to ballrooms and meeting spaces. Besides serving as a grand abode for travelling guests, the campus is also home to many prestigious awards shows, including the Primetime Emmy Awards and the Grammy Awards. 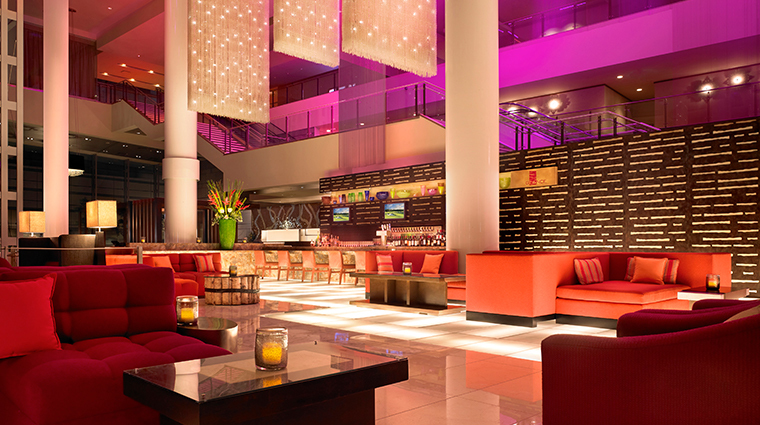 In 2011, the JW Marriott hosted the VMA arrivals in the lobby, serving as the spot where Beyoncé famously announced her pregnancy with Blue Ivy. 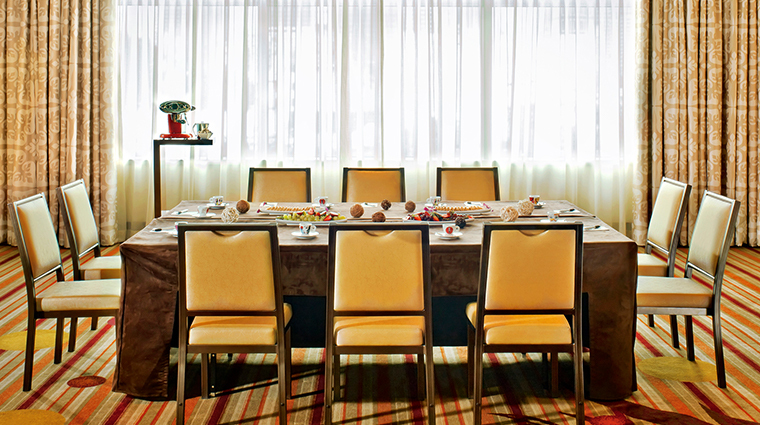 • The JW’s not-so-secret weapon to high occupancy is the almost 100,000 square feet of state-of-the-art, well-appointed meeting and event space, including three stories of stacked meeting rooms. 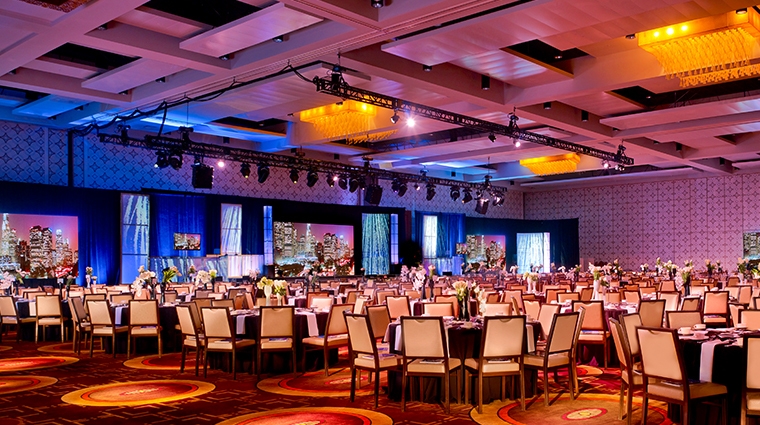 Ballrooms to boardrooms, the sky is virtually the limit for big event customization, from giant soundstages to glittering post-award show parties. 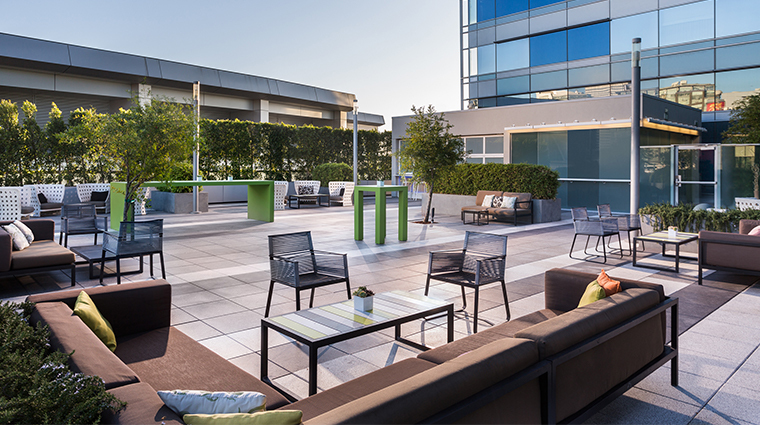 • Residing in this stately hotel tower places guests in close proximity to the city’s beloved NBA and NHL teams, movie premieres, culinary festivals, auto shows, the X Games, the Los Angeles Film Festival and more. • This accommodating hotel provide all of the conveniences from home with its car rental center, dry cleaning services and business center. • The 4,000-square foot fitness center is flanked by crystal-clear windows that have views of the city for miles. 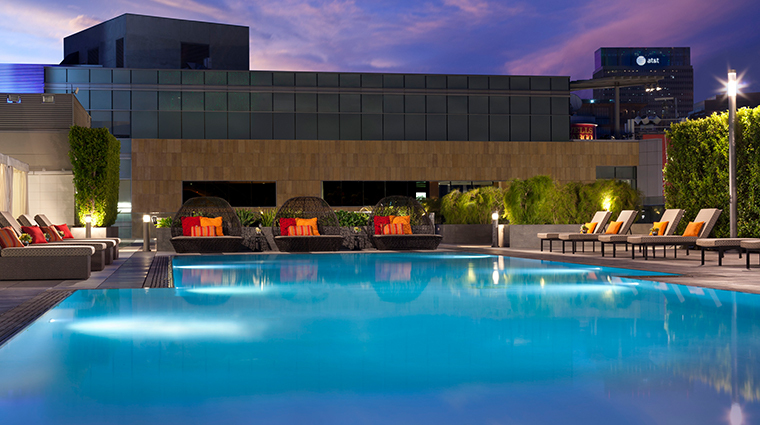 • The fourth-floor pool and sun deck, lined with cabanas and lounge chairs, is ideal for a restful break or a bit of people watching. 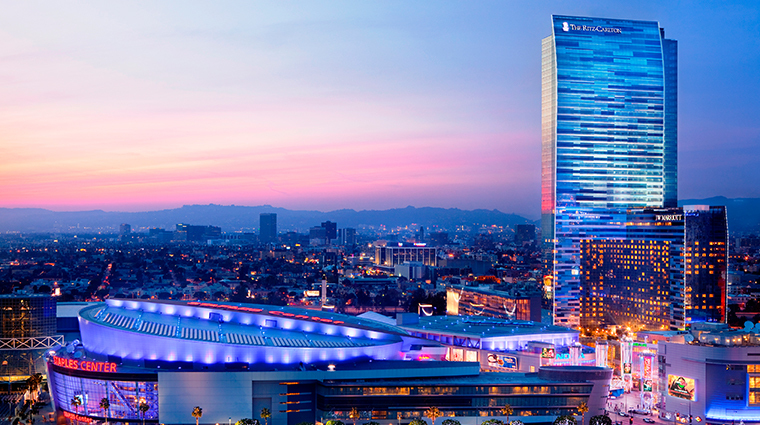 • This eventful hotel occupies floors four through 21 of the 54-story tower that it shares with The Ritz-Carlton, Los Angeles. 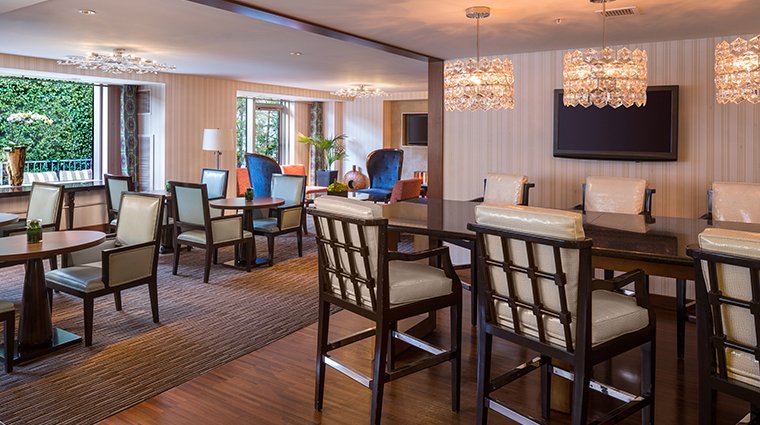 • Hotel guests have access to the The Ritz-Carlton Spa’s soothing space. 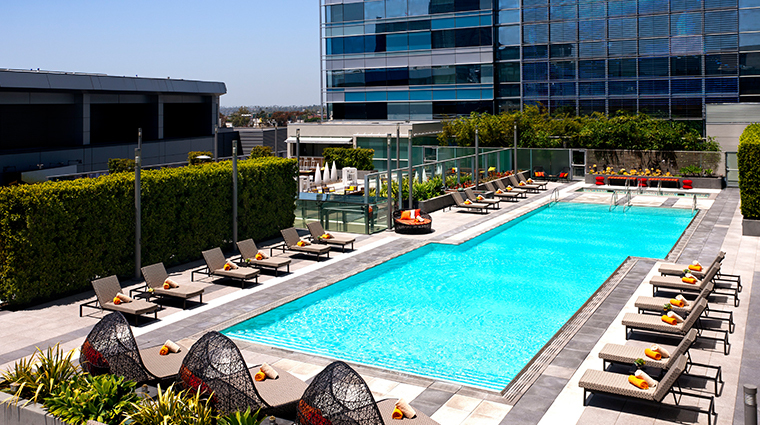 • Staples Center, Microsoft Theater, Club Nokia, the Grammy Museum and the world-famous Conga Room are just a few of many nearby attractions. 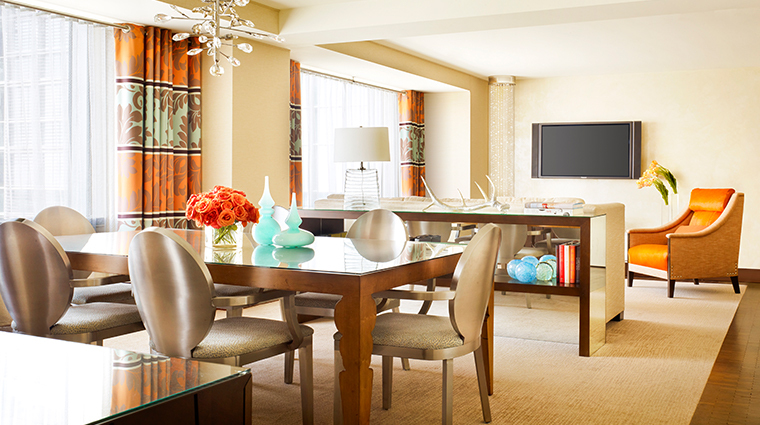 • A modern design scheme draws from the vibrant energy of L.A. Live and the buzzy lobby scene with pops of orange, yellow and blue set against a palette of light neutrals. 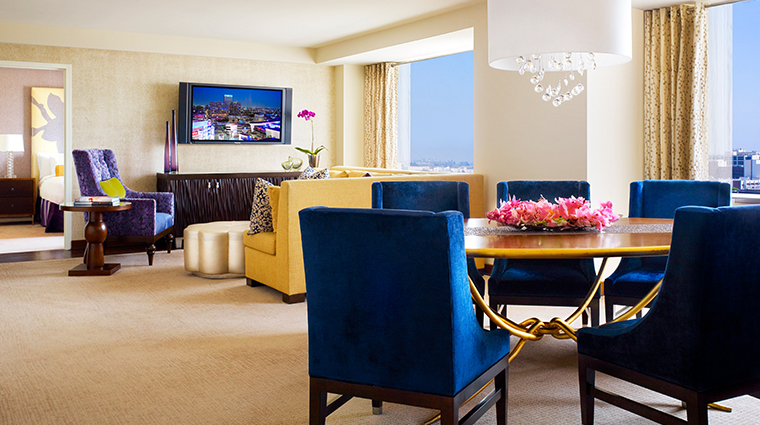 • All rooms include the perks of luxe marble bathrooms and cityscape views. 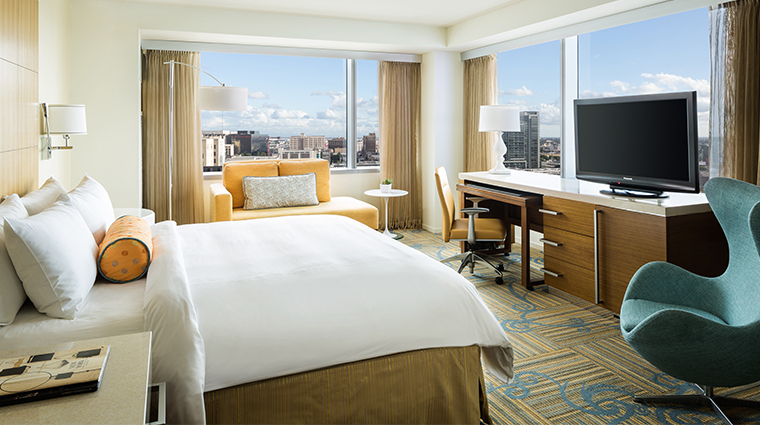 • JW Marriott hotel rooms are packed with technologies and amenities that make it an attractive option for both business and pleasure travelers. 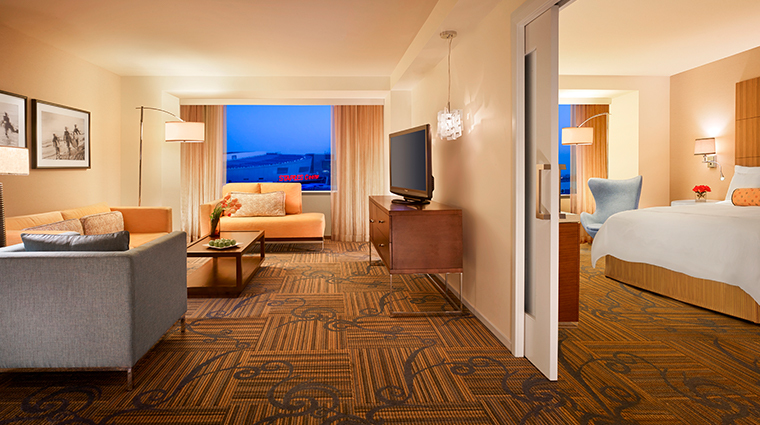 • Well-appointed rooms feature high-speed Internet connectivity, a safe large enough to store laptops, plus creature comforts such as the extra-cozy JW bathrobe. 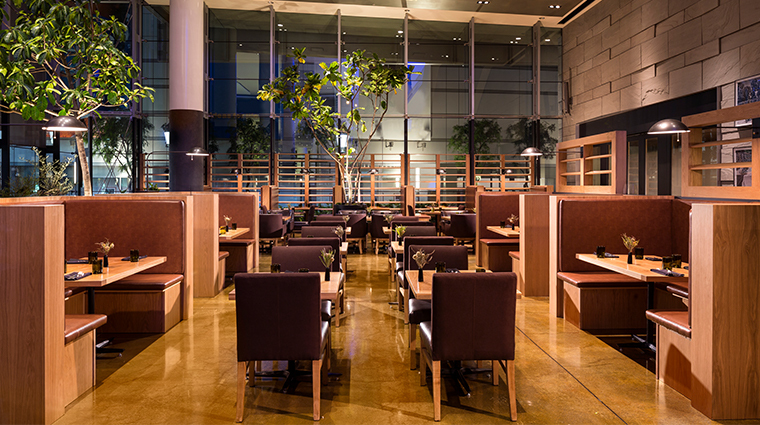 • Located in the lobby, local favorite Ford’s Filling Station anchors the food offerings on the main floor. 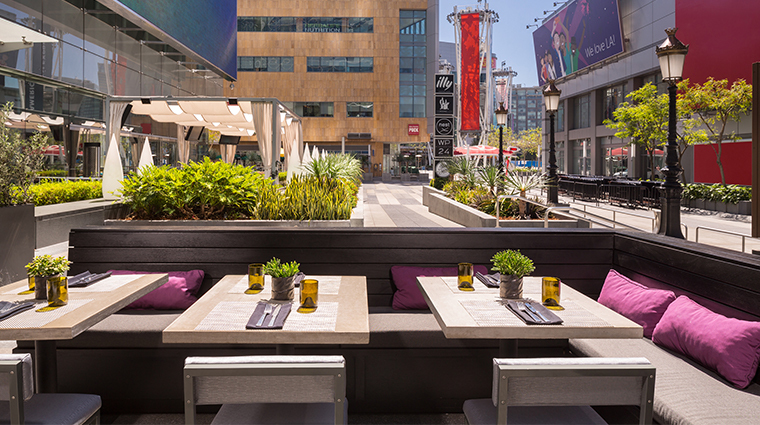 An innovator of L.A.’s organic, sustainable food scene, chef Ben Ford (son of Harrison) focuses his menu on meat — especially pork — in hip, industrial-chic-meets-minimalist-décor. • For quick bites and strong coffee, Illy Espressamente is the spot to grab and go. 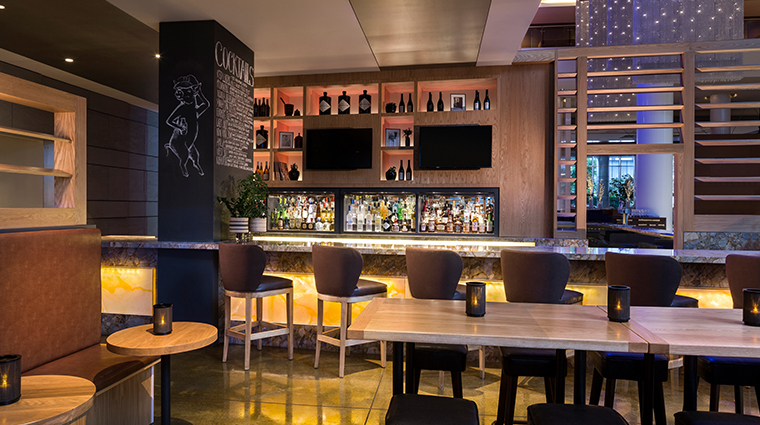 • The Mixing Room cocktail lounge offers a fun venue to kick off a night of reverie with craft cocktails and small plates. 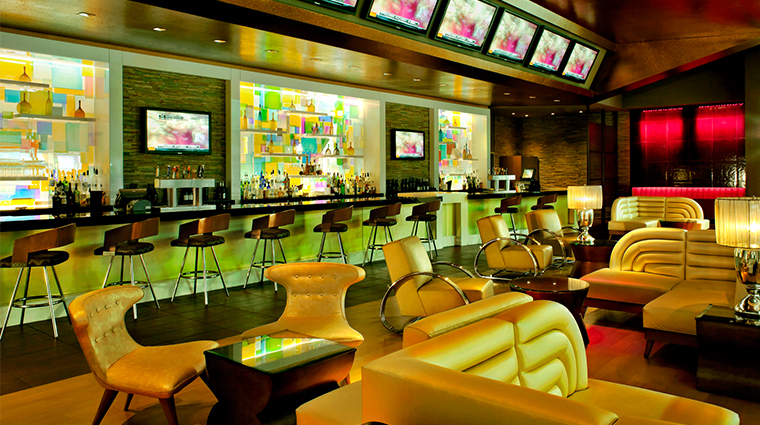 • Glance Lobby Bar is a more casual watering hole where you can order a pint of craft beer. 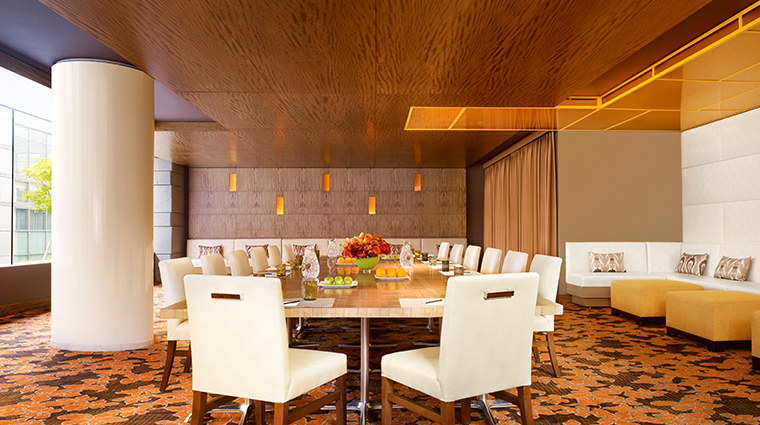 • Upstairs in The Ritz-Carlton’s share of the tower, WP24 by Wolfgang Puck serves classic Chinese fare with California flair.